When I visited Adobe at this year’s NAB in Vegas only a couple of days ago I enjoyed a couple of great demos about the upcoming features in Premiere Pro CS6. But what I really wanted to know was: when will Adobe Creative Cloud be launched and how much will it be? Right now all we know is that Adobe are planning the service, and that it will be a monthly subscription, probably tied to your Adobe ID. 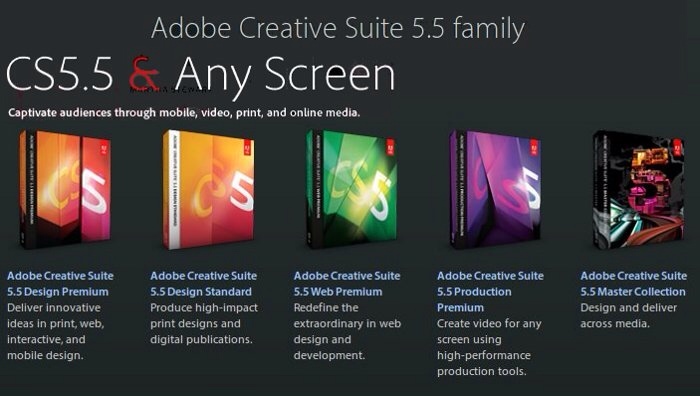 With Creative Cloud users will have access to the entire library of Creative Suite software (so that’s Premiere Pro, Audition, After Effects, Photoshop, and all the rest of them – including Lightroom and Edge), plus a chunk of storage space on Adobe’s servers as well as access to training material. Oh, and let’s not forget access to all the current and forthcoming Adobe Touch Apps like Photoshop Touch for iPad. I hear an illustrator version is in development too. Sweet! Access to the latest versions when they are released would be great news for people like me: I have traditionally held off upgrading rather expensive software and skip a version or two because many of the latest features are often not essential, depending on what you do. Had I not migrated to Mac, I may still be using CS3 products right now, or Dreamweaver MX 2004. How much cooler can you make a code editor really? The other exciting thing is that I held off buying the entire Creative Suite due to its hefty price tag – and hence I would never buy Audition or After Effects – even though I’d love to play with them, learn them and integrate them into my projects. They were traditionally too expensive – but if I can use them if I want to then HURRA! So the question then is: how much will it be? If it’s around $50 per month then that’s $600 per year (about £400), and hence much cheaper than an annual full suite upgrade. It’s about the same as one new single CS product purchased per year. And therefore a no brainer. However if you’re only using one or two products then it may well be cheaper to buy those as upgrades if and when you need them, like I have done in the past. The downside to a subscription model of course is the commitment you’re entering into. Say you don’t want to (or can’t) pay anymore, I bet access to your currently installed software probably stops. If you’ve bought the full version, you can run it no matter if your subscription is up to date or not. It also means you can’t easily offset one project against an expense anymore – it’s easy to argue that if you do a job for £2000 and need software for £500 to do the job, then the software has paid for itself. A subscription makes this less transparent, yet easier to handle because you’re spending less at a time. Just to be clear, and because the term “cloud” is a bit overused and under described right now: Creative Cloud means you are being granted access to software that runs locally on your machine. It’s just a different fee structure to the same software you can buy as downloads or on physical disks right now. Creative Cloud does not mean the actual software runs and executes on Adobe’s servers, and you access them via a web interface or sorts. It does however come with “cloud storage” which integrates into the applications similar to Apple’s iCloud. You will be able to save to the “cloud” (i.e. a friggin FTP server or iDisk or Dropbox-type thing – nothing more, nothing less) and pick it up from another computer you or a colleague is working on. The cloud idea is a welcome addition for collaborative workflows and opens up all kinds of other possibilities for teams or individuals who need access to the same material from different computers and/or locations. I’m excited about Creative Cloud because it gives me access to more Adobe Toys to play with and utilise. The inclusion of all Touch Apps for iPad sounds great, too, even though I don’t know how they would swing it technically. 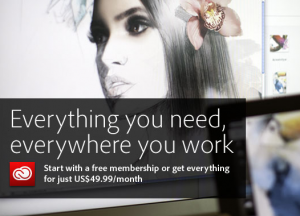 Perhaps offer Photoshop Touch as a free download that requires your Adobe ID to use it? Would Apple approve of it? Do I really care? Cloud storage is a nice addition even though not a major deal. I love the idea of having the latest versions at all times though, and not sometime after they’re been released. It just puts you ahead of the game, which in our ever changing industry becomes more and more important. Looks like the “big announcement” I was told to watch out for was the inclusion of a “preorder” button at the top right of the Create Cloud page.